Docking speaker station maker for iPods and iPhones will debut three new products to its range in 2009 at the CES which include iP1 speaker system, iP71 computer speaker system and iH15 LED Color Changing Stereo System cube. The iP1 speaker system able to support iPods and iPhones, and is rated at 100 watts for its twin 4-inch woofers and two 1 inch silk dome tweeters. It also features with Digital Power Station processor which was engineered by Bongiovi Acoustics. The second product is iP71 computer speaker which also support iPods and iPhones, and can synchronize the devices with a user iTunes library. It also includes a switch to prevent the synchronization when user just wants to listen to their music. The system also plays and charges all docking iPods and iPhones as well as a pair of Reson8 speaker to reproduced sound. 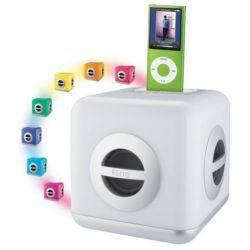 The last product is iH15 LED Color Changing Stereo System cube that light up in variety of colors. It allows user to pre-set their own favorite color or let the cube auto select its own sequence color based on the tracks that are playing. It also uses a set of Reson8 speakers and a passive subwoofer to reproduce a broad range of sound. Currently, the details price and availability date is yet to know.